George Robert Cholister was born in Camden NJ to Harold (Harry) and Hannah Albertha Glandon Cholister on December 18, 1898. He was the fourth of eight children. His father was a police officer in the town of Stockton (which became the present day Cramer Hill and East Camden sections of Camden NJ in 1899), another Cholister relation was involved with the volunteer William Penn Hook & Ladder Company No. 1 in Stockton. At the time of the January 1920 census, George R.Cholister was living with his brother Harry and sister-in-law Katherine Cholister at 2722 Lincoln Avenue in the Cramer Hill section of Camden NJ. George Cholister was at this point working as a helper at an auto and truck business. 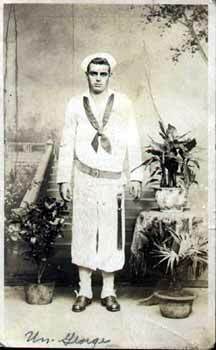 He joined the United States Navy soon afterwards. George Cholister did well in the Navy, and in the and one half years had been promoted to the rank of Boatswain's Mate First Class. 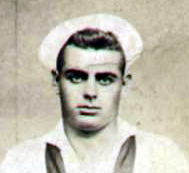 When the light cruiser USS Trenton CL-11 was commissioned on April 19, 1924, George Cholister was part of the crew. The USS Trenton had been laid down on August 18, 1920 at Philadelphia, Pa., at the William Cramp Sons shipyard. She was launched on April 16, 1923, sponsored by Miss Katherine E. Donnelly. When she was commissioned on April 19, 1924, Capt. Edward C. Kalbfus was in command. On May 24, the light cruiser stood out of New York harbor for her shakedown cruise in the Mediterranean Sea. On August 14, while in transit from Port Said Egypt; to Aden, Arabia; Trenton was ordered to Bushire, Persia (Basra in present-day Iraq). She arrived on the 25th and took on board the remains of Vice Consul Major Robert Whitney Imbrie. She received and returned the gun salute to the late vice consul and departed the same day. Following stops at Suez and Port Said, Egypt, and at Villefranche France; Trenton arrived at the Washington Navy Yard on September 29. In mid-October, while Trenton was conducting gunnery drills in the Norfolk area, powder bags in her forward turret exploded, killing or injuring every member of the gun crew. During the ensuing fire Ensign Henry Clay Drexler and Boatswain's Mate First Class George Cholister attempted to dump powder charges into the immersion tank before they detonated but failed. Ensign Drexler was killed when the charge exploded, and Boatswain's Mate Cholister was overcome by fire and fumes before he could reach his objective. He died the following day. 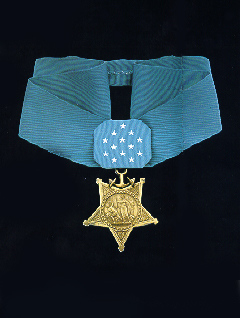 Both men were awarded the Medal of Honor, posthumously. George Cholister was brought home to New Jersey. His father was at that time the yard superintendent at Colestown Cemetery at Church Road and Kings Highway in what was then Delaware Township (present day Cherry Hill) NJ. 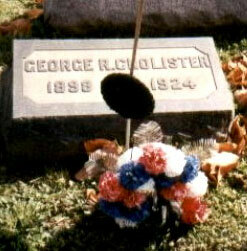 George Cholister was buried there, and rests near his parents. For extraordinary heroism in the line of his profession on the occasion of a fire on board the U S.S. Trenton. At 3:35 on the afternoon of 20 October 1924, while the Trenton was preparing to fire trial installation shots from the two 6-inch guns in the forward twin mount of that vessel, 2 charges of powder ignited. Twenty men were trapped in the twin mount. Four died almost immediately and 10 later from burns and inhalation of flames and gases. The 6 others were severely injured. Cholister, without thought of his own safety, on seeing that the charge of powder from the left gun was ignited, jumped for the right charge and endeavored to put it in the immersion tank. The left charge burst into flame and ignited the right charge before Cholister could accomplish his purpose. He fell unconscious while making a supreme effort to save his shipmates and died the following day.